Hartmann special ball valves in integrated design provide a safe and space saving alternative compared to the use of single valves. By integrating several components or functions in one component not only the installed height and weight is minimized but also safety is increased thanks to saving on flanged connections. A variety of combinations is possible – always adapted to customer specific requirements. The classic Twin Ball Valve for example consists of two integrated ball valves, which can be equipped with two independent barriers each. Thereby the safety can be raised by factor four compared to a standard valve. Another type is a combination ball valve consisting of one 3-way ball valve and two shut-off ball valves integrated in one body. 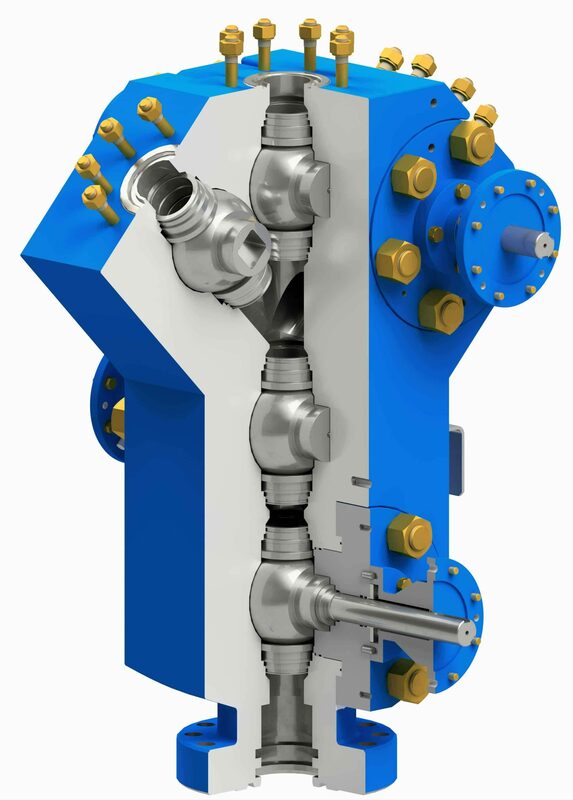 Furthermore, an integrated design of wellhead components is more and more in use in the oil and gas industry as well as in deep geothermal applications. Also these Hartmann solid blocks (see picture) are fitted as standard with metal-to-metal sealing ball valves which are also gas-tight. In comparison to gate valves they offer a very high level of safety as they have a lower tendency towards blocking, are subject to less wear and don’t have to be filled with grease which can contaminate downstream plant parts.